The overall goal of the group is to determine the 3-D structures of proteins with relevance to biomedicine or biotechnology. Our primary technique is protein crystallography complemented by a wide range of biophysical techniques ranging from small angle X-ray scattering and electron microscopy to isothermal titration calorimetry and thermal shift assays. In this EU Horizon2020 funded project a consortium of private companies, led by the Icelandic biotech company Prokazyme (http://prokazyme.com/) and public researchers. will mine the unexplored genomic diversity if bacteriophages from extreme environments. Starting from a massive Next-generation sequencing effort, the goal is to discover new enzymes with novel properties for biotechnological applications. 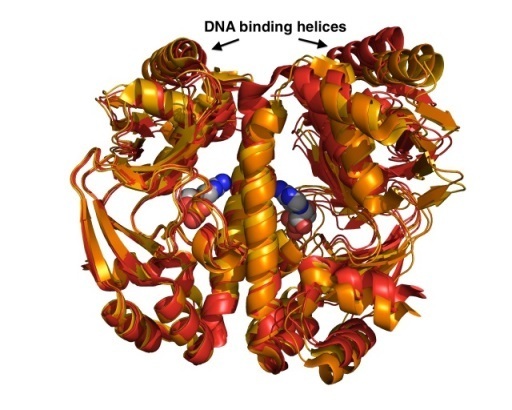 Our group is responsible for the biophysical and structural characterisation of proteins with a specific focus on DNA/RNA binding and processing enzymes. The viability of all bacteria depends on their quick adaptation to the ever-changing environment. In many cases, gene-expression in response to internal and/or external signals is controlled by transcriptional regulators. Using a combination of crystallographic, biophysical and computational tools we investigate ligand binding and the mechanism of DNA recognition. We have solved a number of crystal structures of the Catabolite Activator Protein (CAP) from E. coli and its closely related homologue GlxR from C. glutamicum to dissect structural and dynamic contributions of allosteric ligand and DNA binding. (Rodger, T.L. et al. Plos Biol (2013) e1001651; Townsend, P.D. PLoSOne (2014) e113265). Superposition of crystal structures of Apo GlxR (red) with cAMP bound GlxR (orange) showing the motion of DNA-binding helices. Thermal Shift Assays (TSA) also known as Differential Scanning Fluorimetry or Thermofluor assays are based on the change of fluorescence signal of a chemical probe. This assay can easily be performed using SYPRO orange or a related dye and a standard quantitative RT-PCR instrument. Using SBS 96-well plates the protein-dye mix is slowly heated while the fluorescence signal is monitored. When the protein chain unfolds the hydrophobic core becomes exposed and the fluorescence signal increases until complete denaturation. We have developed new screens in 96-well plate format to investigate protein stability and aid crystallization efforts. 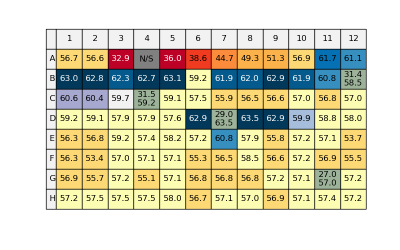 Data analysis and interpretation is automatically done by a freely available program NAMI, which reads the raw data, calculates melting temperature and displays the results in the form of color-coded table (Groftehauge, M.K., Hajizadeh, N.R., Swann, M.J., Pohl, E., (2015) Acat Cryst D71:36-44). 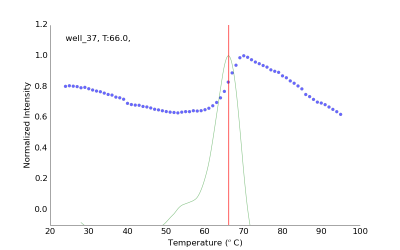 Experimental fluorescence data from one representative well (blue dots), first derivative and calculated Tm of 66 ˚C. Results from the Durham salt screen for crystallization. Blue indicates a significant increase in Tm (stabilization), red a decrease. Structure-based design of Tuberculosis booster drugs in collaboration with the Dr. JC Cole form Cambridge Crystallographic Data Center (http://www.ccdc.cam.ac.uk/) and Dr. A.R. Baulard, Pasteur Institute, Lille. Our group is located in the joined Biophysical Sciences Institute (BSI) laboratories in the Chemistry Department of Durham University. The protein crystallography laboratory has full access to state-of the art protein production and purification equipment (Harbiger Bioreactor, AKTA Explorer, AKTA Pure), biophysical characterization (CD, TSA, FA, ITC, SPR and MS) and crystal structure determination (Innovadyne Screenmaker, Bruker MicroStar, Bruker D8). Financial support has been or is currently generously provided by the EPSRC, BBSRC, MRC, The Royal Society, the Wellcome Trust, the British Society for Antimicrobial Chemotherapy and Horizon2020. Melatti, Carmen, Pieperhoff, Manuela, Lemgruber, Leandro, Pohl, Ehmke, Sheiner, Lilach & Meissner, Markus (2019). A unique dynamin-related protein is essential for mitochondrial fission in Toxoplasma gondii. PLOS Pathogens 15(4): e1007512. Chisholm, DR, Tomlinson, CWE, Zhou, G-L, Holden, C, Affleck, V Lamb, R, Newling, K, Ashton, P, Valentine, R, Redfern, C, Erostyak, J, Makkai, G, Ambler, CA, Whiting, A & Pohl, E (2019). Fluorescent retinoic acid analogues as probes for biochemical and intracellular characterization of retinoid signalling pathways. ACS Chemical Biology 14(3): 369-377. Bruce, D, Cardew, E, Freitag-Pohl, S & Pohl, E (2019). How to Stabilize Protein: Stability Screens for Thermal Shift Assays and Nano Differential Scanning Fluorimetry in the Virus-X Project. JoVE - journal of visualized experiments 144: e58666. Tomlinson, Charles W.E., Chisholm, David R., Valentine, Roy, Whiting, Andrew & Pohl, Ehmke (2018). A novel fluorescence competition assay for retinoic acid binding proteins. ACS Medicinal Chemistry Letters 9(12): 1297-1300. Cardew, E.M., Verlinde, C.L.J.M. & Pohl, E. (2018). The Calcium-dependent protein kinase 1 from Toxoplasma gondii as target for structure-based drug design. Parasitology 145(2): 210-218. Foster, A.W., Pernil, R., Patterson, C.J., Scott, A.J.P., Pålsson, L.-O., Pal, R., Cummins, I., Chivers, P.T., Pohl, E. & Robinson, N.J. (2017). A tight tunable range for Ni(II) sensing and buffering in cells. Nature Chemical Biology 13(4): 409-414. Makiura, Rie, Tsuchiyama, Kohei, Pohl, Ehmke, Prassides, Kosmas, Sakata, Osami, Tajiri, Hiroo & Konovalov, Oleg (2017). Air/Liquid Interfacial Nanoassembly of Molecular Building Blocks into Preferentially Oriented Porous Organic Nanosheet Crystals via Hydrogen Bonding. ACS Nano 11(11): 10875-10882. Mina, John, Thye, Julie, Alqaisi, Amjed, Bird, Louise, Dods, Robert, Groftehauge, Morten, Mosely, Jackie, Pratt, Steven, Shams-Eldin, Hosam, Schwarz, Ralph, Pohl, Ehmke & Denny, Paul W. (2017). Functional and phylogenetic evidence of a bacterial origin for the first enzyme in sphingolipid biosynthesis in a phylum of eukaryotic protozoan parasites. Journal of Biological Chemistry 292(29): 12208-12219. Valdebenito-Maturana, Braulio, Reyes-Suarez, Jose Antonio, Henriquez, Jaime, Holmes, David S., Quatrini, Raquel, Pohl, Ehmke & Arenas-Salinas, Mauricio (2017). Mutantelec: AnIn Silicomutation simulation platform for comparative electrostatic potential profiling of proteins. Journal of Computational Chemistry 38(7): 467-474. Tatum, Natalie J, Liebeschuezt, John, Cole, Jason C., Frita, Rosangela, Herledan, Adrien, Baulard, Alain, Willand, Nicolas & Pohl, Ehmke (2017). New active leads for Tuberculosis booster drugs by structure-based drug discovery. Organic & Biomolecular Chemistry 15(48): 10245-10255. Haffez, H., Chisholm, D. R., Valentine, R., Pohl, E., Redfern, C. & Whiting, A. (2017). The molecular basis of the interactions between synthetic retinoic acid analogues and the retinoic acid receptors. MedChemComm 8(3): 578-592. Chisholm, David R., Valentine, Roy, Pohl, Ehmke & Whiting, Andrew (2016). Conjugate Addition of 3-Buytn-2-one to Anilines in Ethanol: Alkene Geometric Insights through In Situ FTIR Monitoring. The Journal of Organic Chemistry 81(17): 7557-7565. Chisholm, D. R., Zhou, G.-L., Pohl, E., Valentine, R. & Whiting, A. (2016). Practical synthetic strategies towards lipophilic 6-iodotetrahydroquinolines and -dihydroquinolines. Beilstein Journal of Organic Chemistry 12: 1851-1862. Osman, Deenah, Piergentili, Cecilia, Chen, Junjun, Sayer, Lucy, Usón, Isabel, Huggins, Thomas, Robinson, Nigel & Pohl, Ehmke (2016). The Effectors and Sensory Sites of Formaldehyde-Responsive Regulator FrmR and Metal-Sensing Variant. Journal of Biological Chemistry 291(37): 19502-19516. Quinlan, R.A., Bromley, E.H. & Pohl, E. (2015). A silk purse from a sow’s ear – bioinspired materials based on α-helical coiled coils. Current opinion in cell biology 32: 131-137. Grøftehauge, M.K., Truan, D., Vasil, A., Denny, P.W., Vasil, M.L. & Pohl, E. (2015). Crystal Structure of a Hidden Protein, YcaC, a Putative Cysteine Hydrolase from Pseudomonas aeruginosa, with and without an Acrylamide Adduct. International Journal of Molecular Sciences 16(7): 15971-15984. Townsend, P.D., Rogers, T.L., Pohl, E., Wilson, M.R., McLeish, T.C.B. & Cann, M.J. (2015). Global low-frequency motions in protein allostery: CAP as a model system. Biophysical Reviews 7(2): 175-182. Grøftehauge, Morten K., Hajizadeh, Nelly R., Swann, Marcus J. & Pohl, Ehmke (2015). Protein–ligand interactions investigated by thermal shift assays (TSA) and dual polarization interferometry (DPI). Acta Crystallographica Section D Biological Crystallography 71(1): 36-44. Townsend, P.D., Rodgers, T.L., Glover, L.C., Korhonen, H.J., Richards, S.A., Colwell, L.J., Pohl, E., Wilson, M.R., Hodgson, D.R.W., McLeish, T.C.B. & Cann, M.J. (2015). The role of protein-ligand contacts in allosteric regulation of the Escherichia coli Catabolite Activator Protein. Journal of Biological Chemistry 290(36): 22225-22235. Pröpper, K., Meindl, K., Sammito, M., Dittrich, B., Sheldrick, G.M., Pohl, E. & Uson, I. (2014). Structure solution of DNA-binding proteins and complexes with ARCIM- BOLDO libraries. Acta Crystallographica Section D Biological Crystallography 70(6): 1743-1757. Arenas-Salinas M., Townsend, P.D., Brito, C., Marquez, V., Marabolli, V., Gonzalez-Nilo, F., Matias, C., Watt, R.K., López-Castro, J.D., Domínguez-Vera, J., Pohl, E. & Yévenes, A. (2014). The crystal structure of ferritin from Chlorobium tepidum reveals a new conformation of the 4-fold channel for this protein family. Biochimie 106: 39-47. Townsend, P., Jungwirth, B., Pojer, P., Bußmann, M., Money, V.A., Cole, S.T., Pühler, A., Tauch, A., Bott, M., Cann, M.J. & Pohl, E. (2014). The crystal structures of apo and cAMP-bound GlxR from Corynebacterium glutamicum reveal structural and dynamic changes upon cAMP binding in CRP/FNR family transcription factors. PlosONE 9(12): e113265. Quinlan, R.A., Zhang, Y., Lansbury, A., Williamson, I., Pohl, E. & Sun, F. (2013). Changes in the quaternary structure and function of MjHSP16.5 attributable to deletion of the I–X–I motif and introduction of the substitution, R107G in the a-crystallin domain. Philosophical Transactions of the Royal Society B: Biological Sciences 368(1617): 20120327. Truan, D, Vasil, A, Stonehouse, M, Vasil, ML, & Pohl, E. (2013). High-level over-expression, purification, and crystallization of a novel phospholipase C/sphingomyelinase from Pseudomonas aeruginosa. Protein Expression and Purification 90(1): 40-46. An, Jihyun, Farha, Omar K., Hupp, Joseph T., Pohl, Ehmke, Yeh, Joanne I. & Rosi, Nathaniel L. (2012). Metal-adeninate vertices for the construction of an exceptionally porous metal-organic framework. Nature Communications 3: 604. Colgin, N., Tatum, N.J., Pohl, E., Cobb, S.L. & Sandford, G. (2012). Synthesis and molecular structure of a perfluorinated pyridyl carbanion. Journal of Fluorine Chemistry 133: 33-37. Yeh, Joanne I., Pohl, Ehmke, Truan, Daphne, He, Wei, Sheldrick, George M., Du, Shoucheng & Achim, Catalina (2010). The Crystal Structure of Non-Modified and Bipyridine-Modified PNA Duplexes. Chemistry - A European Journal 16(39): 11867-11875. Russo, Santina, Schweitzer, Jens-Eric, Polen, Tino, Bott, Michael & Pohl, Ehmke (2009). Crystal Structure of the Caseinolytic Protease Gene Regulator, a Transcriptional Activator in Actinomycetes. Journal of Biological Chemistry 284(8): 5208-5216. Felderer K, Groves M, Diez J, Pohl E, & Witt S. (2008). Crystallization and preliminary X-ray analysis of the Thermoplasma acidophilum 20S proteasome in complex with protein substrates. Acta Crystallographica Section F Structural Biology and Crystallization Communications 64(10): 899-902. Lucarelli, D., Vasil, M.L. Meyer-Klaucke, W. & Pohl, E. (2008). The Metal-Dependent Regulators FurA and FurB from Mycobacterium Tuberculosis. International Journal of Molecular Sciences 9(8): 1548-1560. Lucarelli, D, Russo, S, Garman, E, Milano, A, Meyer-Klaucke, W & Pohl, E (2007). Crystal structure and function of the zinc uptake regulator FurB from Mycobacterium tuberculosis. Journal of Biological Chemistry 282(13): 9914-9922. Pohl, E, Haller, JC, Mijovilovich, A, Meyer-Klaucke, W, Garman, E & Vasil, ML (2003). Architecture of a protein central to iron homeostasis: crystal structure and spectroscopic analysis of the ferric uptake regulator. Molecular Microbiology 47(4): 903-915.